If you need to lug around your LED/DLP/LCD projector to make visual presentations at a variety of locations, you know there's a huge difference between a projector that weighs something like eight pounds and one that weighs just two or three. But, can a lightweight portable projector still provide the presentation quality needed for boardrooms, classrooms, and home theaters? Yes! These units all have XGA (1024x768) resolution or (the even better) WXGA (1280x800), which makes them a perfect match for today's high resolution laptop displays. The perfect business-ready models may be a little pricey, but that is because lower-priced models do not often support high enough resolutions for business presentations. Note that some of the units in the list below quote brightness in terms of "ANSI lumens." ANSI lumen values are much lower than the lumens quoted by manufacturers and unfortunately there is no easy conversion formula. The only way to tell actual brightness is by direct comparison. Here are the best portable LCD, LED, and DLP projectors for presentations. All are lightweight (some less than two pounds), but are still packed with features to make any presentation shine. Epson boasts being number one in image quality with WXGA Resolution (1280 x 800), which gives two times more resolution than SVGA for HD-quality presentations, and it features fast and easy set-up. 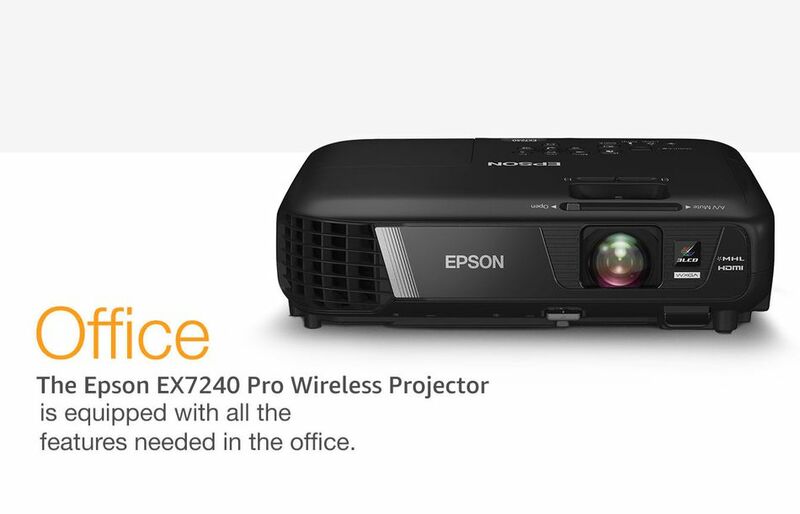 Both of these aspects ring true with this Epson portable projector, but it's the added features such as compatibility with laptops and media players and the ability to display presentations, videos, and photos from MHL-enabled smartphones and tablets while charging your device that make this such a great projector for presentations. Brightness is 3,200 lumens in both color and white and lamp life is up to 10,000 hours. If the quality of your presentations is most important to you and you often present to large groups, spring for this portable projector by Optoma. With native 1,080p high-definition resolution and 4,700 lumens brightness, your presentations will be crystal clear. And this projector's suite of connectivity options and over-network management capabilities make it ideal for large classroom situations. It also has the latest image controller technology and Full 3D compatibility. This ultra-compact LED projector has amazing performance in a small package. Weighing just 14 ounces and measuring 4" x 4" x 1.5" it has 700 ANSI lumens of brightness. With microSD and USB ports, connecting a PC directly to the Optoma is not required as it has a built-in media player and office viewer for presentations straight from a USB drive. The Optoma ML750 supports WXGA resolution as well as HD video (1920x1080) via HDMI. It is also 3D-capable. The LED technology delivers beautiful, crisp images and vivid colors. With very low power consumption and a super long LED lifetime (20,000+ hours) this Optoma is a great choice for a portable projector. At four pounds the ViewSonic PLED-W800 is a solid choice. The LED light source provides 800 ANSI lumens at WXGA and HD resolutions. It comes with HDMI and USB connectors and an SD card slot. Media Player support means it can play video files and display PDF and MS Office documents without connecting the unit to a PC. An optional (but expensive) USB dongle provides wireless connectivity to a PC or Mac. While the W800 is not the cheapest of portable projectors on the list, the 30,000+ hour LED life and minimal power consumption ensure a low cost of ownership. Two things make this Epson portable projector stand out – its versatility and its size (1.7" tall and 3.7 pounds). It has WXGA resolution and an HDMI connector for HD video content, and offers wireless connectivity to Macs, PCs, iPhone/iPads, or Android devices. With 2,600 lumens of color/B&W brightness powered by 3LCD technology, image quality is crisp and clear. A less expensive choice suitable for presentations to small group meetings, the Dell M115HD is truly tiny at 13 ounces and 4" x 4"x 1.4" in size, making it perfect for travel. It only has 450 ANSI lumens of brightness at WXGA resolution and with DLP technology delivers excellent image clarity under ideal circumstances. There are USB, VGA, and HDMI inputs and an optional (though hideously expensive) dongle for wireless connectivity. If you are a business "road warrior" and looking for an excellent projector in a small, lightweight package, the Dell M115HD fits the bill. The Vivitek Qumi Q5 projector is another inexpensive choice that is perfectly adequate for many business presentations. It's tiny footprint (6.3" x 1.3" x 4.0") and light weight (1.1 lbs.) makes it ideal for travel. It supports WXGA and HD resolutions but has just 500 lumens of brightness via DLP technology. Still, the 30,000+ hour LED life means no expensive bulb replacements. Inputs include HDMI and USB, and Office Viewer allows playback of a variety of image formats, documents, and video files without connection to a PC. 3D capable, it also has wireless connectivity via the optional USB dongle. For those who like vibrant colors it comes in blue, yellow and red models. With this many features at a modest price, the Vivitek Qumi Q5 is an excellent choice for a portable projector.